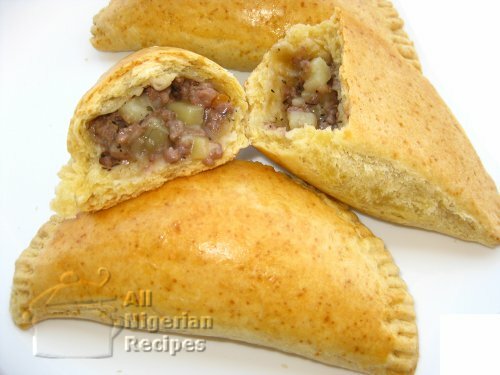 The best Nigerian Meat Pie is moist, yummy and has minced meat, potato and carrot filling. 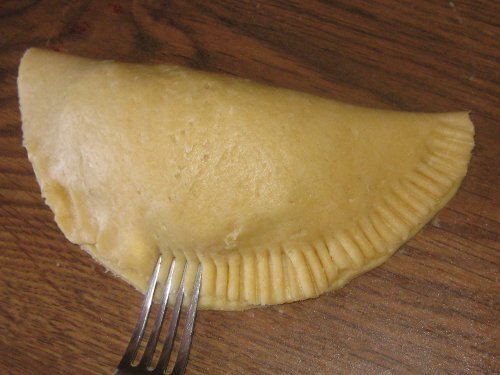 The filling is usually adequately seasoned and gives the meat pie its unique taste. 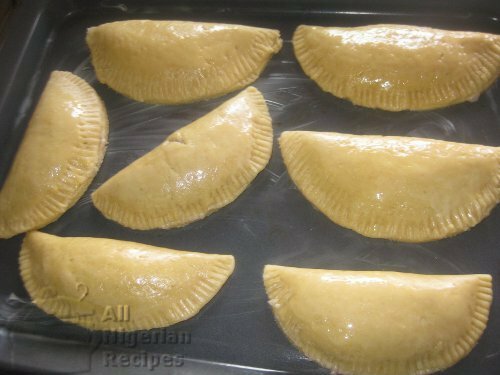 Can I Fry Nigerian Meat Pie? 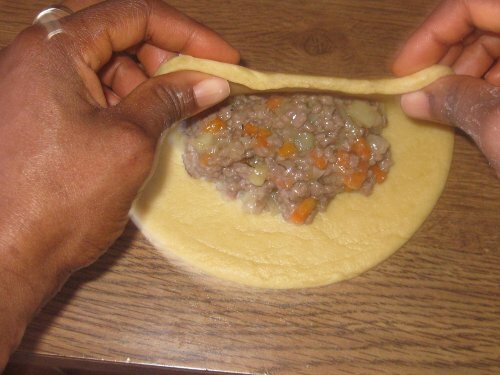 The Nigerian Meat Pie is a popular snack because it is tasty, moist and does not produce crumbs when it is being eaten, if it is well-prepared, that is. The recipe detailed here will help you make the best meat pie recipe. 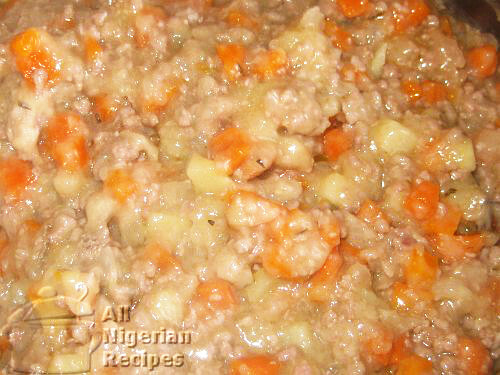 For another version of this recipe visit the Nigerian Meat Pie as a Dessert page. 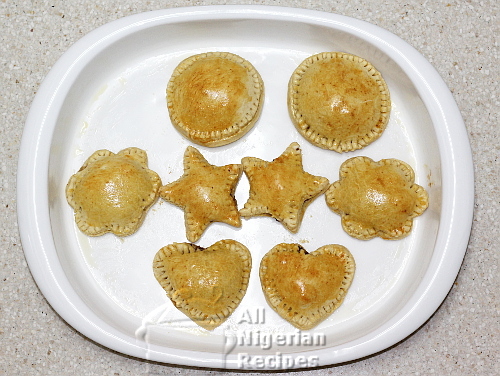 Click >> Different Shapes of Nigerian Meat Pie for how to get the heart, circular, star and other shapes of our delicious Nigerian Meat Pie. The number of meat pies you will get depends on the diameter of the meat pie cutter you use. A cutter that is 8 inches (20cm) in diameter will give you about 10 meat pies with the following ingredients. Peel the Irish potatoes and scrape the carrots, wash and cut these two into tiny cubes. With your cooker or stove set to medium heat, heat the vegetable oil in a pot, add the diced onions and stir for a bit, add the minced meat and stir vigorously till the minced meat turns pale. Add 1 cup of water, Knorr cubes and thyme. Cover the pot and once the contents of the pot starts boiling, add the diced carrots and potatoes and cook till everything is well done. Dissolve 2 tablespoons of plain flour in half cup of cold water and add to the meat pie filling. This tip is so that the meat pie filling does not dry up during baking. It is also what keeps the meat pie filling moist. Add salt to taste, stir the contents and turn off the heat. Set the meat pie filling aside. Now is the time to prepare the dough for the meat pie. Put the 1 kg of flour in a sizeable bowl; add 2 teaspoons of baking powder and 2 pinches of salt. You really do not need a lot of salt for the meat pie dough. The meat pie will get most of its taste from the filling. Mix these dry ingredients very well. 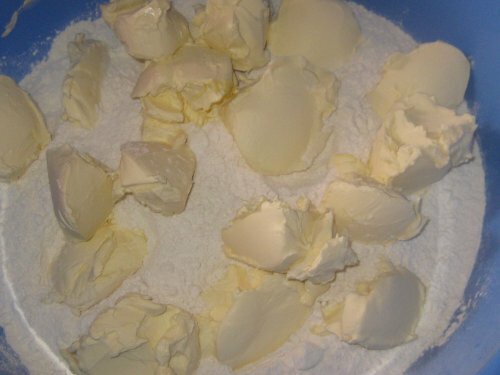 Note: In Nigeria, we also refer to margarine as butter but for my audience in the Western countries, please do NOT use butter for the meatpie dough because butter is too hard and this makes it difficult for you to mix it with the flour to achieve the crumbly look. So please use margarine. Also butter is quite heavy so it makes the dough very greasy which hinders the elasticity of the dough. Can I use melted butter? No, because it simply ruins the meat pie. 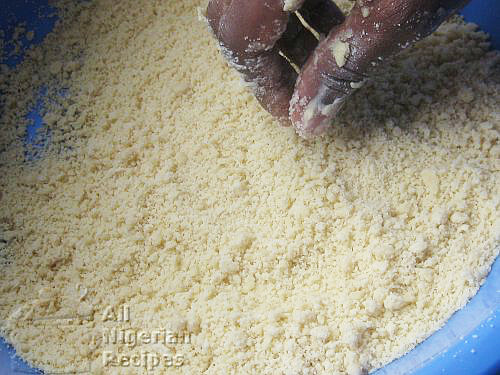 Now, start adding cold water in bits while at the same time folding the mix till a stiff ball of dough is formed. You will be surprised at how small quantity of water you need to get the dough stiff. At most, all you need for the 1 kg of flour is half a cup of water. Knead the dough very well, put back in the bowl and leave to rest for 5 to 7 minutes. This makes the dough more elastic. Set your oven to 170°C (335°F) and leave to preheat while you continue with the meat pie. Rub margarine on the insides of the oven tray and set aside. This is so that the undersides of the meat pies do not burn or stick to the tray during baking. Break the egg, beat it and set aside, you will need it pretty soon. Knead the dough some more, roll it out to achieve a 5mm thickness. 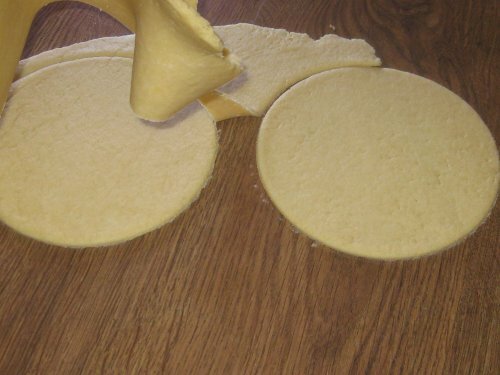 Use a cutter, be it the cover of a small pot or a meat pie cutter, to make round cuts on the rolled out dough. 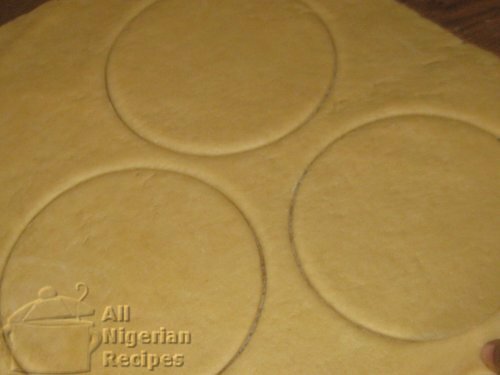 Scoop some meat pie filling into the center of the round cuts, the quantity should be such that you can comfortably close the dough without overflows. Don't worry if you over-filled the first one, you have many meat pies to fill today so at some point you will know just the right quantity of meat pie filling to scoop into the dough. 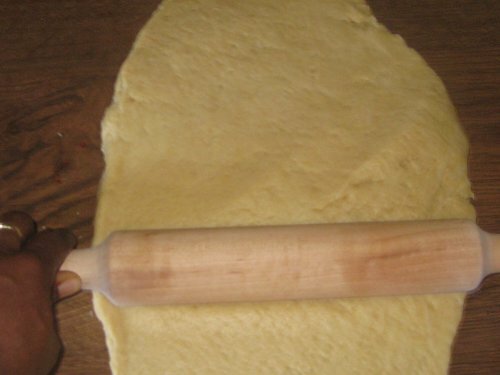 Rub the egg on the inside edge of the cut meatpie dough. Watch the video to see how this is done. This is to ensure that your meat pie is perfectly sealed and does not open up while it is being baked. 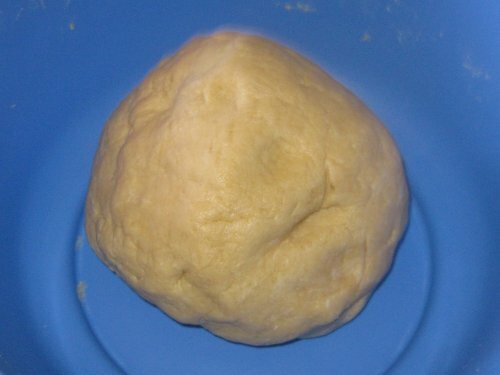 Fold one part of the dough to meet the other end and use a fork to press the 2 edges together to close tightly. Place your work of art in the oven tray and repeat the previous step till all the cut out dough is exhausted. Roll out more dough, cut, fill, close and place in the greased oven tray till all the dough is used. Rub the egg on the meat pies. This gives the meat pie a golden brown look when done. Set the tray in the preheated oven and bake for 30 to 40 minutes. This time will depend on the type and heating capacity of your oven. For some ovens, the meat pie will be done in half an hour, for some, it may take up to 50 mins. Whatever type of oven you have, the important thing to know is that the best meat pies are the ones baked at medium heat. You can confirm that the meat pie is done when it starts browning. It is alright to open the oven to check this. Feel free to use half the quantity of the stated ingredients if you do not want to make as many meat pies.